and Manufacturer's Specifications, or Manufacturer Association Manuals. Eave and Rake Metal Drip Edge: The IBC requires a metal drip edge at both the eaves and the rakes of an Asphalt Shingle roof. The IRC does not. We will be using the IBC requirements for both residential and commercial buildings and will write a correction notice for missing rake metal drip edge on Asphalt Shingle roofs. Hail Damage Prone Areas: The IRC recognizes that most of the Front Range and the Eastern Plains of Colorado including the Metro Denver area is located in a Moderate Hail Exposure Area, which requires the removal of all roof coverings to the deck when installing Asphalt Shingles. Only one layer of Asphalt Shingles is permitted because a single layer is more resistant to damage from hail. The IBC does not recognize hail damage prone areas. Roof damage from hail is the same whether the roof is on a commercial building or residential building. So we will be using the IRC criteria and write a correction notice for more than one layer of Asphalt Shingles. Wind Driven Snow Areas: The ICC Evaluation Service's legacy reports for decades recognized areas with wind driven snow which require both vertical battens to be installed under all horizontal battens with all Tile roofs. Low sloped roofs require 2 plies of base felts applied in shingle fashion since water easily penetrates through the tile and soaks the underlayment. Since wind driven snow frequently blows up under the tiles and also soaks the underlayment, the underlayment should be treated the same on all slopes. Tile roofs require both vertical and horizontal battens and Code approved ASTM numbered underlayments of either 2 plies of Type II underlayment (30 pound base felt) or a single ply of an approved ASTM numbered 90 lbs. rolled roofing or Ice and Water Membrane. This same requirement is stated again in the Concrete and Clay Tile Roof Design Criteria Manual for Cold and Snow Regions: "Felt underlayments are intended to protect the building from wind driven snow or rain. They are required by code. Even a good tile may allow a dry light snow to blow in under it and onto the felt where melting will eventually occur. 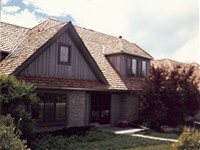 On a well designed tile roof, the underlayment generally wears out before the tile. Two layers of ASTM D226, Type II, No. 30 asphaltic felt overlaid in shingle fashion is the recommended minimum." So we, like a few other City/County Building Departments, also recognize that this is a Wind Driven Snow Area and will write a correction notice for missing vertical battens or risers and/or the approved above listed underlayments and listed in our roofkey Roofing Guidelines web page. Any approved alternate underlayment equal to ASTM D226 Type II underlayment (30 pound base felt) must also be applied in the same shingle fashion with 2-ply coverage. Eave Ice and Water Membrane: The 2006 IBC and IRC was changed to better define when the use of an ice and water membrane is required. The current definition all through Chapter 15 of the IBC and Chapter 9 of the IRC is: "In areas where there has been a history of ice forming along the eaves causing a backup of water a membrane that consists of at least two layers of underlayment cemented together or of a self-adhering polymer modified bitumen sheet shall be used in lieu of normal underlayment" In other words, if your area has ice forming along the eaves which by the very nature of ice damming backs up water, you must use an ice and water membrane. The entire Colorado Front Range as well as most of the rest of Colorado has ice forming at the eaves to various degrees every year from 2" to as much as 18" as in January - February of 2007. Some Building Departments are unaware of the damage ice damming has caused their citizens because Building Permits are generally not obtained to make the necessary repairs. So, like some Cities and Counties, we recognize there is ice forming along the eaves and will write a correction notice for missing ice and water membranes at the eaves. Weather Blocking Material (approved flashing): The ICC Evaluation Legacy Reports and the Tile Manufacturer's Installation Manuals require weather-blocking material (approved flashing) to be installed. From the 2010 Tile Manufacturer's Manual "Openings at the hips, ridges, and headwalls including chimneys, skylights, solar panels, and down slope horizontal abutments shall be fitted with weather blocking material to keep water on the surface of the field tile". It is also required for flashing at jacks and vents. Flashing on the surface of a tile roof is needed in areas where debris can accumulate as also stated in the manufacturer's manual and is common sense. Debris will accumulate just from trees in all areas. All other types of roofing material have always required flashing to be placed so that the water is kept on the surface of the field roofing material for obvious reasons. Therefore we will write a correction notice for missing primary flashing (flashing on surface of tiles) as well as secondary flashing (flashing over the underlayment but under the tile) at all Jacks, Vents, Head Walls, Rake Walls, Chimneys, Skylights, Curbs, Swamp Cooler Ducts, Hips, Ridges and any Other Protrusions through the tile roof to help keep as much water as possible on the surface of the tile and limit the access for debris and critters to get in under the tile. (See our roofkey Roofing Guidelines web page for Clay and Concrete Tile under Primary Flashing and/or Weather Blocking Material for more information.